Clean the Pori to remove the husk. Ensure that is crisp enough. Spread it on a plate. Mix jaggery to water and bring it to boil and ensure that the jaggery dissolves completely. Strain it through a seive to remove the impurites. Cut the coconut into small pieces (about 1/4 cup of coconut pieces are enough for 3 cups of pori). Bring the jaggery mix to boil and bring it to a syrup consistency. Add the coconut pieces, dry ginger powder and cardamom powder. Bring it to a one string consistency. Pour the syrup over the pori using a laddlelittle by little. Ensure all the pori is covered with syrup. While pouring the syrup, ensure it is mixed thoroughly. Better use a wooden laddle. Smear ghee in hand, shape small balls. Ensure it is not pressed very hard because if done so, it will get too hard when cold. Rollthem in the palm of your hands. 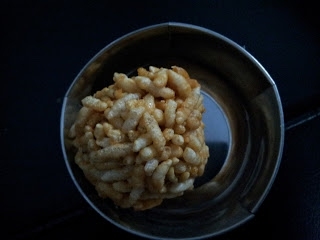 Note: In general rice flour is used while making balls, but ghee is used to give a shine to the urundais. 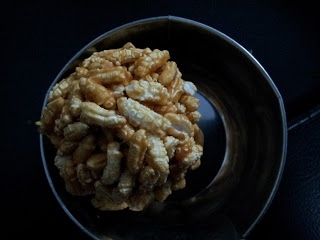 While adding the jaggery syrup for the nel pori do it little by little so that the crispness of the poris dont go off.